In this episode, a massive grid computing operation designed to save the children is about to be abused by a sock puppet. It's amazing how quickly the scope of everything can shift from one episode to the next. The last episode was a narrow, intimate affair that focused squarely on Rika and Renamon. They're still the primary characters here (if there are any), but the implications of their bio-merge are just a small part in the broader picture. Instead of a cold pit filled with nasty red death, the focus is on the entire span of both worlds, as the whole Digital World rises up in defense while everyone in the real world tries to pull the kids home safely. After everything that's happened, it's strange to see a full retreat. It's certainly defensible, given their original objective and how fragile their route home is, but when was the last time the protagonists stared death in the face, but turned around and went home without even trying to engage it? There wasn't even a whole lot of arguing about it. Can you imagine Taiki in this situation? Good luck getting him to the chopper. It is a strange way to wrap things up in the Digital World. Technically, the mission was successful: they rescued Calumon and ensured that Zhuqiaomon would not endanger the real world again. At the same time, instead of a climactic showdown against the final boss, they discovered that the final boss was only doing all that as a desperate reaction to this massive enemy that was capable of destroying everything. So do they stay and fight D-Reaper? No. Do they take back what was stolen and run? No! They let Zhuqiaomon finish what he was planning all along, using Calumon to beef up his army for the great battle. Keep in mind that it's entirely possible that Zhuqiaomon was not only planning to use this army to stop D-Reaper, but to go all Data Squad and invade the real world as well. It may still be in the back of his head. Either way, Calumon totally unloads here, releasing his full power in a moment that goes from serene to surreal. His power to ease evolution is well documented, and watching this little guy realize his purpose and fulfill it with such lack of fear is a beautiful culmination to his story. His Shining Digivolution, in conjunction with the digi-gnomes, results in Megas all over the place. The tamers insist on taking some time to analyze a bunch of these, and one pesky little critter gets all cute with Kenta. It feels very much like one of those Pokémon moments that insists on spotlighting a dozen new monsters because it doesn't have time to give each of them their own episode in that season. Amusingly, this includes a trio of Diaboromon, who as Crysalimon just finished getting their revenge on a distracted Beelzemon. Once they evolve, they leave him alone, reverted back to Impmon, who is in rough shape. How Renamon picks up his scent as the tamers reach the rendezvous point we'll never quite figure out, but she and Rika insist on going after him. This is where their shared Sakuyamon experience is important, as sharing bodies with another being has to generate a whole ton of empathy. The fact that Rika would risk not getting home safely in order to save Leomon's killer suggests a serious awakening- the ultimate “walking in someone else's shoes” moment if you will. It's not just her that steps up to save the day. D-Reaper's attack on the Hypnos network forces the Monster Makers to use grid networking to make the necessary calculations to keep their ark on course. In a moment very reminiscent of the movie, people from the all over agree to lend their processing power. The key differences are that this influx of support is actually helpful, and that many of the contributors here are adults (including Rika's grandmother). This is one of the only times in the franchise that a large group of grown-ups help the cause in a significant way. They should be commended. Holy God that puppet is creepy! We know Jeri's lost it, but when her sock puppet appears to have a mind of its own, that's where things are really starting to fuel nightmares. And seriously, how do Takato and Kazu not notice her eyes after they “find” her following her disappearance? Either the girl seriously needs some Visine or there's a problem. Takato and Kazu attribute Jeri's disappearance to a bathroom break (which worked so well when Matt vanished in Adventure), which does cast doubt on the “not needing to eat” philosophy of the Digital World applying to that as well. Each of the four Sovereign (or at least the beasts they're based on) represent a cardinal direction. I'm surprised the animators didn't have them in their appropriate rotations every single time they were shown. They were on a few times but anime is usually pretty clinical about patterns like that. 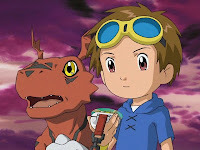 Yamaki appears to speak at the computer, with his words appearing as an e-mail to Takato. I didn't think they had Dragon speech-to-text software back then. 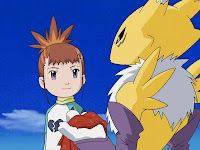 Renamon claims to have a connection to Impmon when she senses him. Yes, she was closer to him than anybody else, but she's also close to Terriermon and Guilmon. She didn't have enough of a “connection” to find them when she, Rika, Kazu and Kenta were separated from the pack. That whole grid computing business, where users volunteer their computers' spare processing cycles to assorted causes, is a very real thing. It's used for not only medical, but ecological and aeronautic calculations as well. But holy crap, getting enough juice that way to do such short-term, time-sensitive math is insane. And if there are really enough people out there willing to turn their computers over because they get an e-mail asking them for help saving some kids, I'm a Nigerian prince that needs your help getting my money out of the country. Contact me for details. Well, do you as a nigerian prince, have a governmental e-mail address? Because there are reasons why Hypnos was discovered, Yamaki was going all out in more ways than one. The eyes trick is only there to help the audience distinguish who's who. And being far more scary/disturbing/traumatizing than 95% of horror movies out there. Finnaly, although it may seem hard to realise now, they've been in the Digital world for five months (they entered in October, got out in February) and they still had no idea how to get home. So when Yamaki told them of a way when the whole place was going to become a battlefield, they sure as hell weren't going to refuse it out of some divine courage. Hi, I couldn't find a proper way to contact you directly, so I figure I might as well do it here. 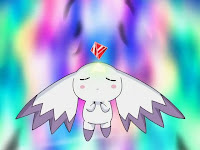 First of all, I really love your blog and I respect anyone that keeps the digimon community alive. Can you link to the blog?I'd like to see it.